Begum Kulsoom Nawaz’s funeral prayers will be offered at Lahore’s Sharif Medical City on Friday at 5pm. Ex-premier Nawaz Sharif’s wife’s casket reached the provincial capital this morning on PIA flight PK-758 from London. Her body was received by members of the Sharif family, including Hamza Shahbaz, and was later transported to the family’s Jati Umra residence via ambulance. She will be laid to rest at Jati Umra near the graves of her father-in-law Mian Sharif and brother-in-law Abbas Sharif at Jati Umra. Congregational prayers (Rasm-i-Qul) for Begum Kulsoom will be offered on Sunday between Asr and Maghreb, according to PML-N Spokesperson Marriyum Aurangzeb. Funeral prayers were offered for Begum Kulsoom at London’s Regent Park mosque on Thursday, where hundreds of people showed up to pay their respects. The funeral had been arranged since Kulsoom’s sons, Hasan and Hussain, cannot travel to Pakistan. 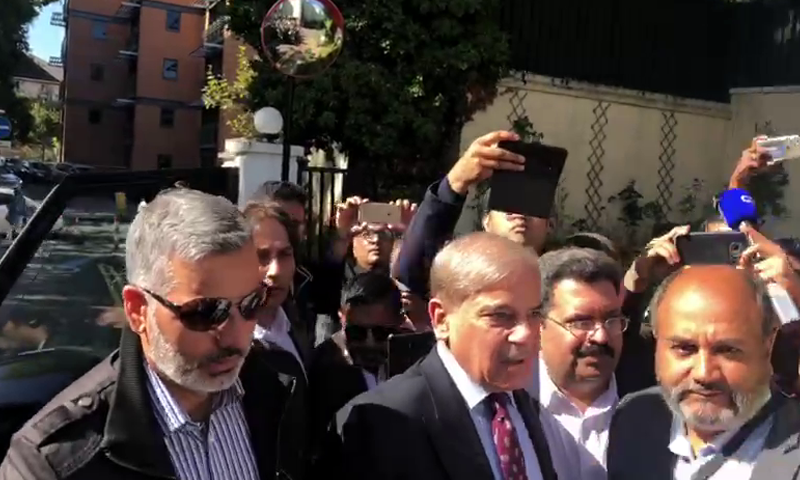 Other members of the Sharif family, including Asma, Nawaz and Kulsoom’s daughter, Shahbaz Sharif, and Zikriya Sharif were all in attendance at the funeral in London, alongside other known faces such as former finance minister Ishaq Dar and former interior minister Chaudhry Nisar. Shahbaz had travelled to London, where he arrived on Wednesday evening, to take Begum Kulsoom’s body back to Lahore for burial. Begum Kulsoom, who was diagnosed with lymphoma in August last year, passed away in London on September 11. 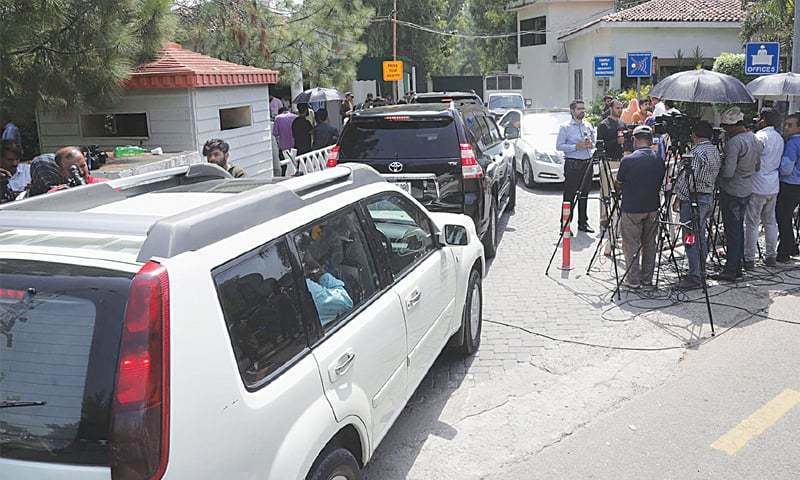 The sources said the family had received a death certificate issued by the private hospital where Begum Kulsoom Nawaz breathed her last on Tuesday, and the “out-of-England” letter from the coroner’s court, paving the way for the departure of her body to Lahore this evening. Nawaz Sharif, his daughter Maryam Nawaz and son-in-law retired Captain Safdar, who were all sentenced to jail by an accountability court weeks before the July 25 polls in the Avenfield property reference, were granted parole by the Punjab government on an application moved by Shahbaz in order to attend Begum Kulsoom’s funeral. The Punjab Home Department later announced an extension in the short 12-hour parole for an additional five days, from Sept 12 (4pm) to September 17 (4pm). The time does not include the time it takes to travel. 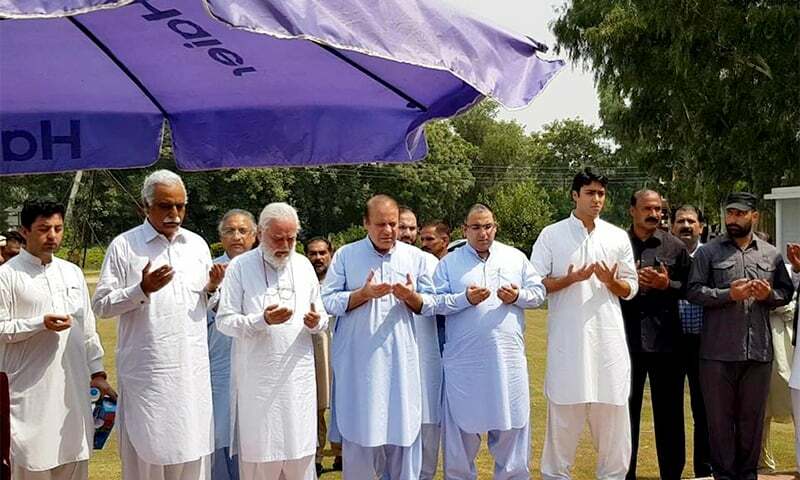 Also on Thursday, Nawaz Sharif paid a visit to Sharif Medical City to oversee arrangements for his deceased wife’s last rites. The former prime minister directed that all arrangements for the funeral be complete so that everyone is able to comfortably offer the funeral prayers. “There should not be any kind of issue in Sharif Medical City,” he had said. He was accompanied on the visit by his son-in-law retired captain Muhammad Safdar, grandson Junaid Safdar, and nephew Salman Shahbaz. During the course of this visit, Nawaz met some PML-N leaders at Sharif Medical City. To condole her demise, PML-N and other political party workers have been visiting the Sharif family residence at Avenfield House in London and Jati Umra in Lahore since Wednesday. Former Balochistan chief minister Sardar Sanaullah Zehri and Rasikh Elahi, son of Punjab Assembly speaker Chaudhry Pervaiz Elahi, were prominent among the visitors in London. In Lahore, political leaders and workers including former prime minister Shahid Khaqan Abbasi, Khurram Dastagir, Maulana Fazlur Rehman, Azad Jammu and Kashmir Prime Minister Raja Farooq Haider, Malik Pervaiz, Saad Rafique, Ameer Muqam, Ali Pervaiz, Uzma Bokhari and Rana Mohammad Iqbal visited Jati Umra to offer their condolences. 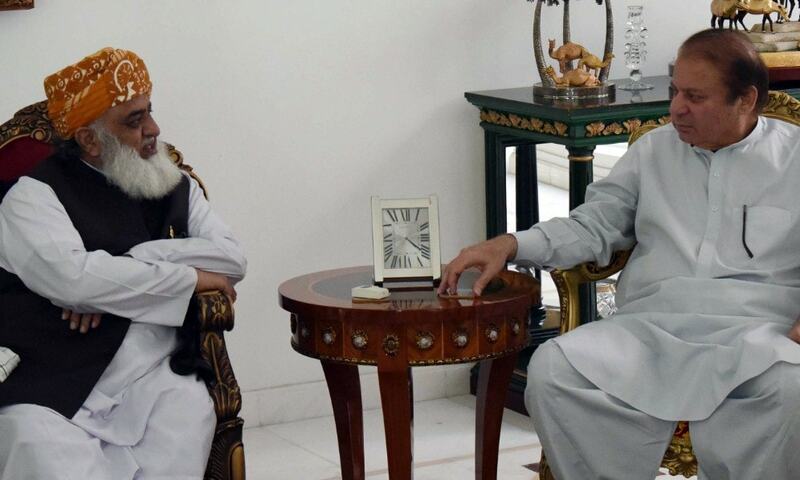 JUI-F chief Maulana Fazlur Rehman pays a condolence visit to Nawaz Sharif. Hamza Shahbaz met those arriving at Jati Umra to condole the death of the former first lady. Former president Mamnoon Hussain also called on Nawaz on Thursday and offered his condolences to the PML-N quaid. Former president Mamnoon Hussain also called on Nawaz and offered condolences on the demise of Begum Kulsoom.